This resource is an effective tool designed for an individual, Pastor, sidewalk advocate, or counselor to connect and continue the conversation about LIFE while remaining approachable. 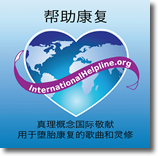 The number on the card will connect the caller to our 24/7 International Helpline. Callers can speak with a trained phone consultant who has experienced the pain of abortion and healed to a place to help others. The call is confidential. Callers will be offered local resources for mental & sexual health counseling, abortion recovery, and pregnancy care. I agree to remain Peaceful, Law Abiding and Approachable while sharing the truth about LIFE. I will not use offensive language or graphic images in conjunction with the distribution of this card. I agree to donate the suggested $12 for the cards and shipping. Suggested Donation: $12 for a box of 500 cards includes shipping. Produced by New Liberty Videos. Features Millie & Dail Lace's abortion story and a special feature involving Concepts of Truth's, Thomas Aaron Story. Countless women have been overwhelmed by post abortion trauma, resulting in fear, anxiety, pain and guilt. Many suffer in silence for years after they realize the full toll of their choice. From desperation to devastation to deliverance, Life After Abortion takes an honest look at the undeniable impact abortion has had on real people, as told by those who experienced them. 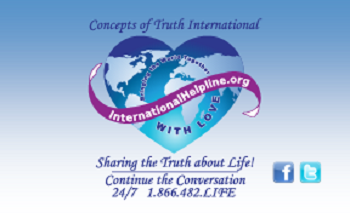 I have personally reviewed Concepts of Truth International's abortion recovery curriculum Concepts of Recovery The Journey, and find it to be solid Christianly and clinically. This valuable, well conceptualized and well-written resource no doubt will be a powerful agent of healing, growth, and redemption to many persons hurting from their intensely personal stories of shame and trauma. It expertly yet compassionately addresses the pain and pathos of post-abortion recovery both directly and deeply. I recommend it highly. The DVD provides an overview of the importance of Abortion Recovery and how to begin leading small groups within the church. It is an excellent resource for pastors and professional or peer counselors to bring about an awareness to this unreached mission field. A collection of short, riveting stories by 14 women and one man that explain the desperate situations that drove each of them to choose abortion. It also describes their abortion experiences, tells of the heartbreaking aftermath of their decisions, and illustrates how they found healing and peace. These captivating first-person accounts reveal a side of the abortion issue that is seldom heard. This book is designed as a resource tool for counselors, teachers, ministers and other professionals who work with clients who have been sexually abused. It gives voice to the client's inner struggles while bringing them hope for healing.